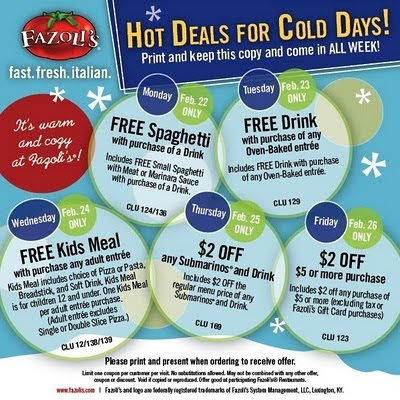 Starting Monday, Febraury 22nd, you can save when you Dine Out at Fazolis. In fact, there is a special offer every day, all week long! Just click the picture above and then print out that page and take it with you. You will need to keep the coupon and re-use it with each visit. If you’d love to get these offers in your own in-box, just sign up right here. Here‘s another great coupon for $2.00 off of a $5.00 purchase (click Calendar of Offers). Not sure you can combine it with the one above or not.